The ultimate goal for my knitting skills is to one day create lovely designs the likes of Anna, Eunny, Ysolda... etc. But since I've only been knitting for just under 2 years (and they, I believe, since they were 2) I have a lot of work to do. But I have taken some steps in the right direction. Before last Christmas I completed my own sweater from my very own pattern. Simplistic in design, and modern in fit. It turned out well and wore it several times throughout the winter. I would have worn it more if the neckline wasn't so wide that it revealed my bra straps, assuming I didn't have a tank top underneath. Despite that, I considered it a success. 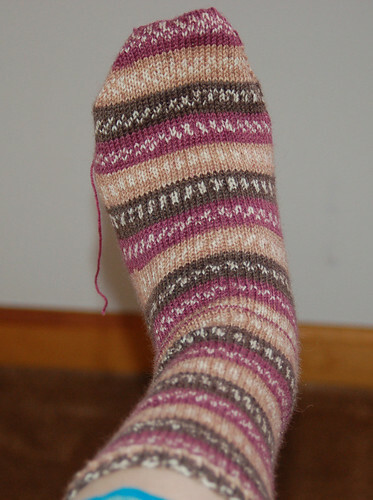 Then, during spring I kept myself sane/busy with designing my own sock. I've made a simple sock on my own before thanks to tutorials such as this. I did the same thing on this sock, but made it fancier. I grabbed the lace pattern from The New Knitting Stitch Library by Lesley Stanfield. I liked that it was a more geometric than foo-foo so I paired it with some bright green yarn to give it a "sci-fi" theme. 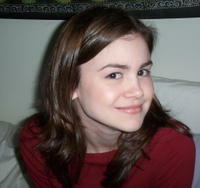 This version you see here is take two. The first take was to small since the lace pattern doesn't have a lot of stretch. Of course I waited until after the sock was complete, ends weaved in and all, to actually try it on and discover this. So for my redo I added stitches to my CO and split the lace panel in two with some 2x2 ribbing in between. Much better fit this time. It's actually a little roomy. So I'm thinking this will be my first pattern that I will post on this site. It will be free, of course, since I can't take full credit for it's construction. 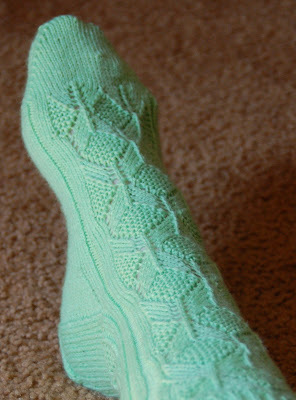 I'm going to complete the second sock to test my notes, then post the pattern. Hope you like it. I think they're pretty neat myself. That's really nice :D The lace is much better for not being foo foo and makes it look very structured and tidy. I for one will look forward to when it is published! Wow, I really like it. Very nice! Awesome job! They turned out really nice!